The Crystal Serenity is sure to provide the perfect cruise holiday for everyone in the family on journeys to North America and New Zealand. You will have one of your best holiday experiences on board the Crystal Serenity, no matter what way you are looking to spend their vacation. If you are the active type the tennis court and golf driving range will help you keep your heart rate up, while ‘Crystal Spa & Salon’ is the ultimate spot for relaxation. The ‘Creative Learning Institute’ will make sure you keep your brain sharp with classes available in Tai Chi, art instruction and the ‘[email protected]’, a high-tech learning venue with complimentary classes. 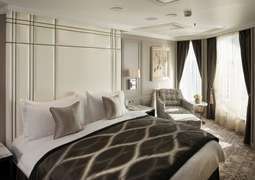 For a taste of luxury, you can book a crystal penthouse suite, complete with veranda, and enjoy your cruise in superb style. 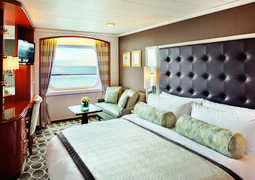 The Crystal Serenity offers a wide range of dining options. The ‘Crystal Dining Room’ is an elegantly designed dining hall with superb menus available. For the perfect choice the ‘Lido Deck’ is where you need to go, offering everything from a Californian dining experience at ‘Tastes’ to frozen yoghurt and ice cream at ‘Scoops’. With a range of bars for you to celebrate into the night, the Crystal Serenity will ensure you enjoy every moment on board. Onboard the Crystal Serenity there are exclusively outside cabins, so everyone will have a beautiful sea view. You have the choice between a room with a panoramic window or you can opt for a private balcony. All cabins are spacious and are tastefully decorated, including a bath so you can relax in the comfort of your own space. In addition, there is free room service available throughout the day. You can choose from a variety of top-class restaurants and themed bars. Dine at Prego restaurant, which is perfect for lovers of Italian food, or let your taste buds be spoiled at the Crystal Dining Room with a delicious meal and a glass of wine from the world-famous wine collection. For a light bite, you can try the sushi at the sushi bar. In addition, there are several places around the pool area where you can grab a quick snack throughout the day. If you don’t want to leave your bed in the morning, room service will deliver your breakfast straight to your door. You will never be bored with the numerous entertainment options available. Whether you spend the evening at one of the bars, watching a show, attending a dance class or relaxing in your cabin, you are assured a great time. Show off your talent during a karaoke show and see the performances of Broadway and West End performers. You can enjoy the evening with a cocktail and live music or watch the latest Hollywood movies in the theatre. Try your luck at the casino or dance the night away at the disco. For those who want to quietly spend the evening in your cabin, there is the opportunity to rent a movie or book from the extensive library. Let yourself be pampered in the Crystal Life Spa. Feng Shui-inspired, this haven of relaxation offer amazing treatments as well as Pilates and yoga classes. On board, there are two paddle-tennis courts and a gym. Have a swim in one of the two pools or unwind in one of two jacuzzis. Crystal Serenity also provides enrichment workshops, offering you the chance to develop a skill, take part in a wine tasting or simply attend a lecture to learn more about certain subjects. There’s a range of shops on board with luxurious brands of cosmetics, clothing and jewellery to offer. Treat yourself to a pair of Dior sun glasses, or a Hermes bag, something special to remember your holiday by. Facets is the on-board fine jewellery and watch boutique, where you’ll find collectors items and gifts to bring home. 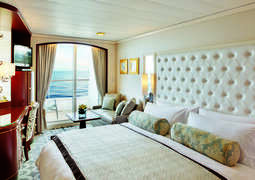 On board the Crystal Serenity, enjoy dressing casual during the day. The evening dress code is from 6.00pm and it depends on the day: Formal attire evening means long evening dresses for women and a tuxedo or a dark suit for men. On informal evenings, women wear a cocktail dress or trouser suit and men wear suits. The dress code not only takes the stress out of packing but really ensures you experience the refined elegance Crystal Serenity offers.